You are here: Home / Unchain Our Friends! Note: Every dog in the below photos was reported to the SPCA. Little or nothing changed for them. Shortly after AAS launched this report the BCSPCA sent out a province-wide press release announcing its chained dog campaign, making statements that sounded much as though it was going to take action. It made its announcement in Prince George, BC, where many dogs are chained all year, where the temperatures can drop to -40 degrees in the Winter. 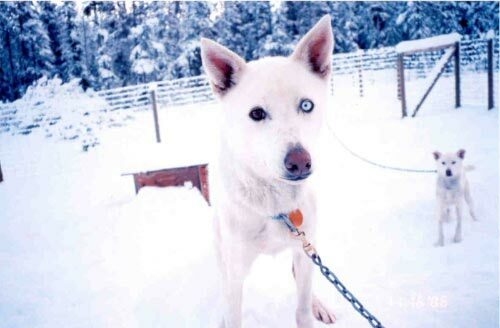 2010: AAS continues to get reports of cruelty neglected dogs from all over BC, many from Prince George, some who are suffering from diseases, all of whom have been reported to and ignored by the BCSPCA, like Cherry. 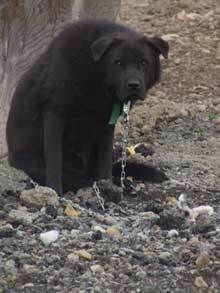 Countless chained dogs in BC, some chained in sub-zero conditions, some with no protection from the cold or rain or heat, are still not being helped in a more meaningful way than the SPCA telling the owner to get a longer chain and clean up the feces. The SPCA frequently seizes for a lack of food, water, and shelter, but seems unable to relieve the far worse distress of a life of isolation. The making of this video was prompted by many kind-hearted people reporting suffering dogs to the BC SPCA, with no discernable improvement resulting, or so little that the dog can’t be said to no longer be suffering. “Suffering” is one of the reasons in the Prevention of Cruelty to Animals Act for which a dog can be seized. In 2003, BC SPCA CEO Craig Daniell told Animal Advocates that he hoped to convince Crown that the word “suffering” can mean psychological suffering. If Crown accepted that it is possible to win in court on that definition, and in fact did win, it would set a precedent which could be used to seize other socially deprived dogs and charge the owners with cruelty. Mr. Daniell also told us, that the danger is in setting a bad precedent by losing and so the SPCA would have to chose its case carefully. Write the BC SPCA. Tell them that you want the PCA Act used to help all suffering, isolated dogs, whether they be on chains or other tethers, in pens, in garages, in sheds, under porches, in closets, or in basements. Tell the BC SPCA you want it to use the word "suffering" in the PCA Act to prosecute for the suffering that more people in BC have to witness every day than all the media-attracting puppymills and starving horses put together. But there are many dog experts in North America, the most famous actually living in Vancouver, who could be called to give expert testimony that psychological suffering is as bad, or worse than a lack of food, water, and shelter. Has the SPCA asked Crown to use these experts? And has Crown declined to use these experts to convince a judge to rule that psychological suffering is suffering under the Act. Is that why we have never heard of a cruelty trial where expert witnesses are called to defend that interpretation of suffering? 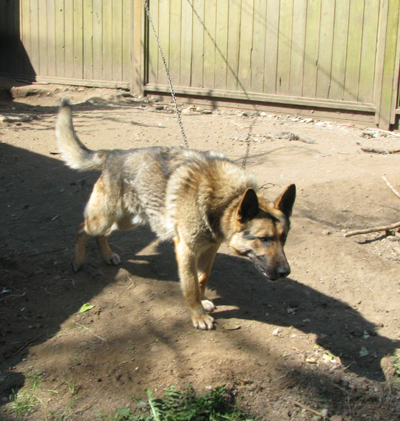 For about a year the BC SPCA in Surrey was called by neighbours about this chained German shepherd dog. Three people were present when the dog’s owners admitted that an SPCA inspector had come, and told them that if the SPCA ended up with the dog they would have to put it down, and added that it was a good thing the chain was strong or the dog might harm someone if he got loose. Those words from BC’s only animal society with the legal power to help chained dogs can be explained by the fact that in Surrey, as in some other BC municipalities, the SPCA is the dog-catcher, paid to protect the public from dogs. That appears to many people to be in conflict with the SPCA’s generously supported mandate to protect dogs from people. There was no attempt by the SPCA to use the PCA Act to seize this dog and then to attempt to convince Crown to use “suffering” to mean such extreme psychological suffering that the SPCA believes the dog must be killed. That is the cruel catch 22 for chained dogs. 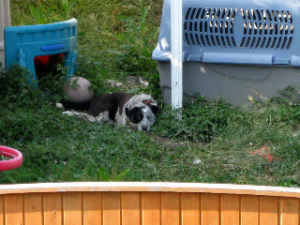 There appears to be no meaningful legal help for them from the SPCA, and if they end up at an SPCA they may be killed. There are fewer chained dogs and yard dogs in Vancouver since Animal Advocates reported more than 50 of them to City Council in 2001. Councilors were shocked when they saw our photos and read the stories! No one had told ever told them about all the cruelty going on, in so many Vancouver back yards. They instructed the SPCA to start being proactive, and very slowly things improved. But even now, in 2009, Animal Advocates is told of pitifully neglected yard dogs that have been reported to the SPCA and little or nothing has changed. In towns outside of Vancouver, and especially on farms, many dogs still suffer lives of isolation, boredom, inactivity, anger, self-mutilation, depression, and despair. 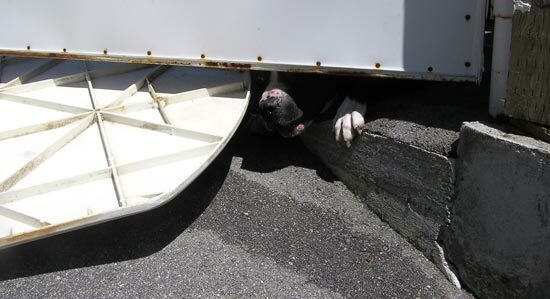 In the last few years the SPCA ran a widely promoted End Cruelty Now campaign which resulted in more statutory powers for it, but seemingly didn’t give it the power to relieve the suffering of chained and isolated dogs. 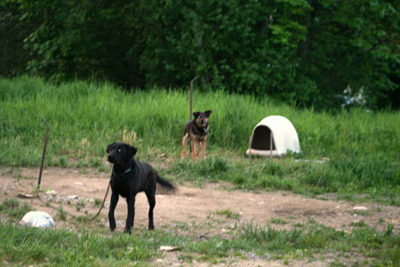 In 1998, Animal Advocates sent a chained dog report to every provincial MLA, asking for the PCA Act to be amended to provide protection for these dogs. We received much support for our request from MLAs of all parties. But the SPCA told the government that there was no need for improvements to the Act. And so the changes that might have prevented more than a decade of suffering were quashed. 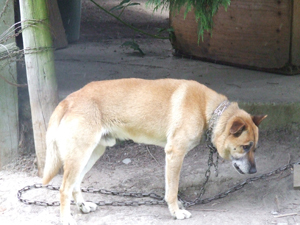 At about the same time that the Surrey SPCA told the owners of the chained shepherd that they had to be sure the dog didn't get off his chain, AAS received an email about this dog. It was tied to its only shelter from freezing cold, storms, and blasting heat for "21/2 years, night and day, to a crate". Because of a high fence, it had no view of anything. The glass doors to the house were kept screened so that the dog wouldn't see the family inside and cry and bark at them. It was never taken off its tether. "Never off a chain, never walked. When owners open up door it wags its tail but they ignore it. Yelled at when it cries. They throw the food out the door. Poo everywhere and urine. Very dirty and sad. 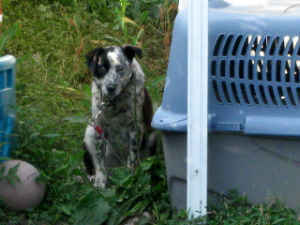 "Janice from the SPCA said that an officer went o ut there, and told the owners have 14 days to clean up. They were told to put the dog on a longer lead so that it was not pooing and peeing where it was laying. So they [the owners] took the lead off, and the dog was jumping around and tail wagging. Then they put the lead back on, only a longer one." From many other reports AAS gets, it appears that telling the owner to clean up feces and put the dog on a longer tether is all the SPCA feels it can do. 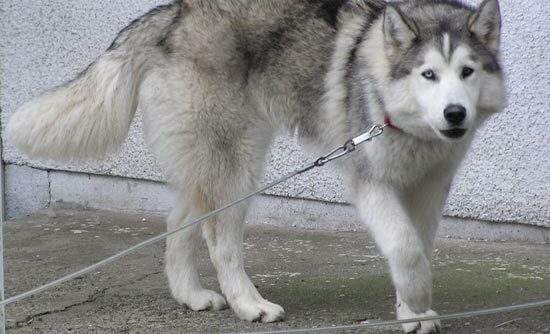 The BC SPCA's website says plainly: "If you still insist on using a tether, ensure there is no w ay he can become entangled in other objects..."
That is the best the SPCA feels it can do for tethered dogs. Is the answer for there to be a new SPCA campaign, specifically to have animal-lovers tell their MLAs how upset they will be if they don’t pass legislation preventing one of the most-hated cruelties in BC? They've waited for the law to speak for them long enough. 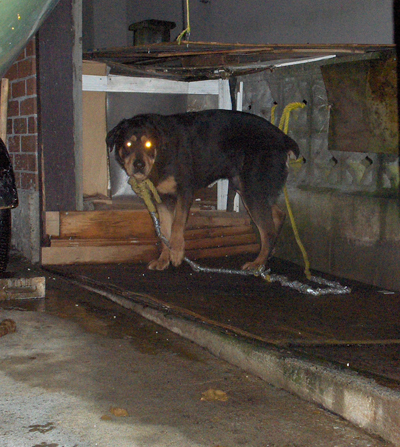 It’s time for the law to speak for chained dogs! Shouldn't keeping dogs this way be as illegal as puppymills? animal-lovers joined together by the internet is changing animal protection and welfare in this province. Use your power for the animals!